A behavior that is commonly seen off Northern Vancouver Island in British Columbia, Canada amongst a Killer Whale family is tail slapping. A Killer Whale has many different aspects in their behavior and one of them is tail slapping which is seen quite regularly by whale watchers off Northern Vancouver Island in British Columbia. Some people have witnessed this type of behavior when the whales are in close contact with their pod or grouped together with other pods which seems to be a form of communication. 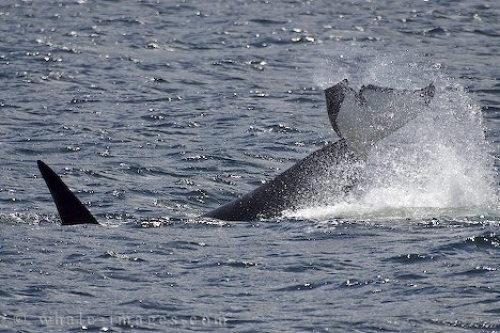 Whether tail slapping is a friendly or an aggressive form of behavior is not proved beyond a doubt but a majority of the times it seems to be a playful thing especially within the Northern Resident Whales. The sound that echoes after a tail slap can be very loud especially when the water is calm and there is nobody else in the same vicinity except for the boat that you are on. Other times that tail slapping is seen is when a Killer Whale plays amongst a kelp bed allowing the kelp to wrap around its tail flukes. Sometimes they will flick the kelp in the air off of their tail and then slap the water hard with the flukes of their tails. Killer Whales have also been seen using their tail as a form of catching food, especially when a Transient Killer Whale is after a seal, dolphin or larger catch. There have been pictures taken where a Transient Killer Whale will swat a seal with its tail sending it flying through the air, another unique behavior that is not seen very often especially off Northern Vancouver Island. A transient killer whale does not display their tail in their social behavior pattern as much as the Northern Resident Killer Whales do. When a Killer Whale gives humans a chance to see their tail, you will notice that the underside is mainly white except for the black outline that continues from the top side of their flukes. Each behavior performed when a Killer Whale uses its tail is very exciting and interesting to watch while out on a whale watching tour off Northern Vancouver Island.